The center's social surveys confirm this – 61% of Russians have not read the Bible, 40% believe in God and only 4-7% regularly attend church services. According to statistics, more and more Russians believe in UFOs, sorcery and clairvoyance. Such trends result in stagnation both in society and in the economy, experts believe. According to research by the Levada Center pollster carried out in December 2015, 36 percent of Russians believe in horoscopes, 26 percent in eternal life and 32 percent in aliens. A year ago these indicators were between six and nine percent lower. Levada Center Director Lev Gudkov notes that a “magical consciousness” is taking root in Russia, that is, the refusal to understand the cause and effect relationship, the modern way of thinking. This way of reasoning is being squeezed out by the mythological way of thinking, especially because of the active diffusion of religion. The Levada Center says that in 25 years of surveys the share of those who consider themselves Orthodox has grown by four times to 77 percent. "But there is no evangelistic, Christian inculcation of the consciousness, beliefs and ethics," said Gudkov. "It turns out that conversion to Orthodoxy is a sort of paternoster against misfortunes, a certain insurance for the afterlife." The center's social surveys confirm this – 61 percent of Russians have not read the Bible, 40 percent believe in God and only 4-7 percent regularly attend church services. In other words, there really are not so many true Orthodox believers in Russia. Gudkov remarks that the demand for magical help is growing. According to the center's surveys, in 1990 38 percent of Russians believed in evil eyes and spells and in 2012 the percentage increased to 59. It is not surprising, adds Gudkov, that magical artifacts can be found everywhere: little icons in cars, charms and amulets. Holy relics also play this role – people can stand in line for several days to see them and ask for a miracle. 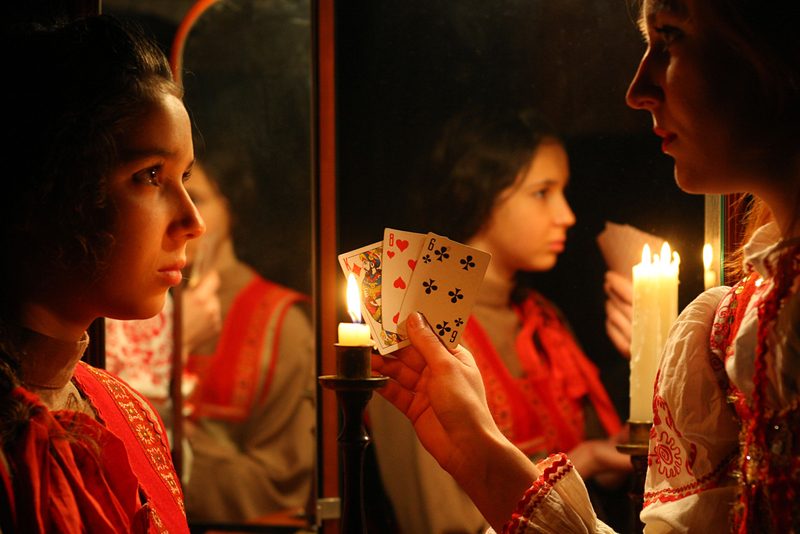 In 2013 a Russian Academy of Sciences Sociology Institute survey showed that 67 percent of Russian women turn to magicians, fortune-tellers and psychics for help (four percent of the men also admitted this). The Russian Orthodox Church is also very fashionable. In recent years Orthodox churches throughout the country have held dozens of prayers for protection from the crisis, terrorism and the fall in oil prices, as well as for farmers and import substitution. The growth of magical consciousness was noticed in Russia in the 1990s. Lev Gudkov says that the reason was the collapse of the idea of the self, society and the world and of the value system caused by the fall of the USSR. Masses of people were disoriented and after 70 years of a totalitarian regime their dependence on their surroundings was very high. In the 1990s the feeling of helplessness increased: "This was compensated by the growth in the demand for miracles, a leader and the transference of responsibility onto that leader," said Gudkov. In his opinion, today most Russians expect help from external powers – governmental, chthonic or occult. This is why people do not trust anyone except the president. Ideologically this all manifests as conservatism, says Yevgeny Gontmacher, deputy director of scientific work at the Institute of World Economy and International Relations. "This includes Russian traditional values, spiritual clamps, which, actually, have not formed," said Gontmacher. These have not formed because for now the Russian consciousness, in Gudkov's words, is a "mixture of various ideas with orthodox attributes." Yevgeny Yasin, scientific collaborator at the National Research University of Moscow’s Higher School of Economics, explains that without politicians belief in supernatural powers would not have become so widespread in Russia. "This expresses the aspiration of people to hold on to their power, to increase their influence. They act this way because mechanisms that are based on democratic methods have not been introduced in Russia," said Yasin. Moreover, in the view of Professor Boris Gershman from the American University in Washington, looking back at McCarthyism in America, the rebirth of superstitions in an atmosphere of paranoia and fear (of witches, communists, native Americans, Muslims, immigrants) "can be intentionally used to mobilize the electorate or form a certain type of social attitude." Inculcating obscurantism, in the words of Gudkov, also helps to suppress social discussions and remove independent authorities and opinions, including scientific and moral ones. The matter may be even simpler. Indulgence in a mythologizing consciousness squeezes out critical thinking. This means that the preservation of the status quo, the equilibrium, even if at rock bottom, becomes much easier. External stability is preserved but it must be paid for, like in many African countries. And it will not be possible to obtain a qualitative growth of the economy, and not just growth in GDP from oil and gas, without investment in the "economy of knowledge," in human capital.